The state of Hawaii has some of the most restrictive gun laws in the country. They require permits to purchase firearms, your guns must be registered, and getting a concealed carry permit is damn near impossible. Despite all of this, Hawaii has a thriving "gun tourism" industry. Susannah Breslin, writing in Forbes magazine, tells of her recent trip to the 50th State. To be fair, my husband spotted it. We were walking along Kalakaua Avenue in Honolulu, Hawaii, and there, on the bustling-est street in Waikiki, was a shooting range. “What?” I said, gawking at the Waikiki Gun Club. I’d come to Hawaii for the beach, the food, the weather. Apparently, some people come for the firearms. In fact, as you walk down Kalakaua, you’ll see guys holding signs for shooting ranges and wearing T-shirts with targets on them. It’s their job to bring tourists to the smattering of shooting ranges in the area. One flyer offered “REAL GUNS” and “FACTORY AMMO” at the SWAT Gun Club. Another displayed the different firearms — from a 9-mm Beretta to an AK-47 — you could shoot at the Hawaii Gun Club. It was like Telegraph Avenue in Berkeley, California — except for instead of burning incense and selling hemp necklaces, they were hawking the fruits of the Second Amendment. According to Lynn Selman of the Royal Hawaiian Shooting Club, the bulk of their customers are from overseas. She estimates that about 60% are Japanese, 30% are either Australians or New Zealanders, and the remaining 10% are locals or mainlanders. The club itself is located in the Royal Hawaiian Center along with high-end stores like Cartier, Hermes, and Fendi. Why this many Japanese? It is because gun laws in Japan make owning a gun damn near impossible and because they've seen guns in all the action movies. Having seen them, they want the opportunity to shoot them because they aren't going to get that chance at home. While it is rather sad that these tourist have to come to Hawaii to get a chance to shoot, I'm glad that they are taking advantage of it. The more the Japanese and Australians and New Zealanders see that shooting can be fun, hopefully it will mean they will start pushing a little bit more at home for less restrictive gun laws. At least one can hope that. Read the whole article by Breslin. It is interesting. It also is a warning of what the future might look like if we don't work to preserve our Second Amendment rights now. The Complementary Spouse and I enjoy hitting thrift stores, antique malls, and the like. What we call "junkin'" is a cheap way to spend a Saturday afternoon. Inspired by a post by SayUncle about safety razors and having seen the prices for Gillette Fat Boys and Schick Kronas on EBay, I thought I might find something at one of the local antique malls like the one below. I had no such luck. I did see a handful of straight razors but the thought of trying to correctly use one of those to shave is too scary for me. However, the trip was not made in vain. The first thing that caught my eye was the bright red Prius below. Unlike the usual Prius seen in Asheville with its "Another Mama for Obama" bumpersticker, this one had of all things a NRA sticker on the front door window! An older gentleman (but not the owner of the Prius) sitting near the door of the mall saw me taking the picture and said he was a NRA member. He said he'd joined a couple of years ago and now was being audited by the IRS. While I would hope the story is somewhat apocryphal, one never knows nowadays given the way the IRS under the Obama Administration seems to be targeting groups and people opposed to Obama. The second thing that caught my eye was a nice fountain pen in a variegated green. I knew it was a Sheaffer the moment I saw the white dot on the cap. I ended up getting it for $20. 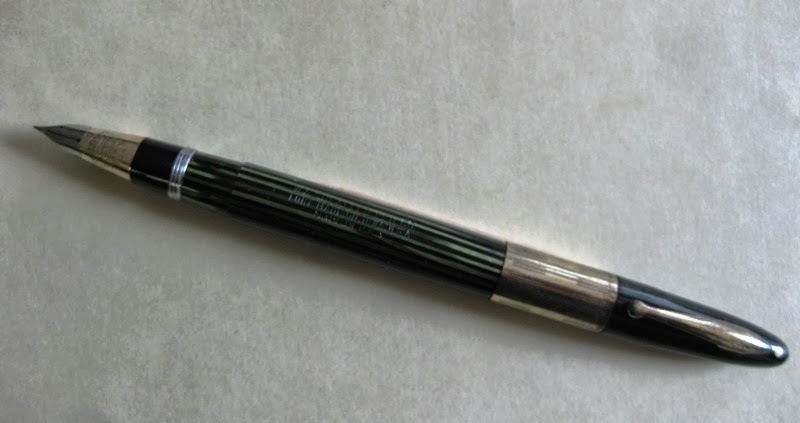 When I got home I did some Internet sleuthing and found out it was a Sheaffer Triumph Lifetime Vacu-fil in marine green striated made between 1942 and 1949. It is in excellent shape but I still need to test to see whether it will hold ink. The band and the clip show some brassing but I can live with that given the great shape the nib is in. It was all in all a fun day. As to that safety razor, I may end up doing what SayUncle did and just buying a new Merkur from Amazon. The prices of those old Gillettes on EBay are a bit much. As the Second Amendment Foundation begins its annual Gun Rights Policy Conference today, one new topic of discussion may well be the suit they filed today on behalf of themselves, Shooters Committee for Political Education (SCOPE), Long Island Firearms, and two individual plaintiffs. The suit challenges that part of the New York SAFE Act which limits the number of rounds that are allowed to be in a lawful magazine to seven rounds unless a person is at a shooting range. With the exception of single stack magazines for the 1911 and a few pocket pistols, most magazines for semi-auto pistols hold more than the seven round limit. Caron et al v. Cuomo et al was filed in US District Court for the Northern District of New York. The complaint notes that magazines containing ten rounds and more are in common usage for lawful purposes and that firearms containing ten round magazines are "therefore not dangerous and unusual weapons" per the Heller decision. The complaint goes on to note that individual self defense is "‘the central component’ of the Second Amendment right” as noted in the McDonald decision which was quoting Heller. The suit seeks a declaratory judgment that the seven round limitation violates the Second Amendment and preliminary and permanent injunctions against enforcement of that part of the NY SAFE Act that limits the number of rounds to seven. The lead attorney in the lawsuit is David Jensen who has brought a number of lawsuits on behalf of the Second Amendment Foundation. A survey of Irish farmers by the Irish Examiner and the Irish Creamery Milk Suppliers Association (ICMSA) said that over 80% believe they should be allowed to own a gun to protect themselves and their property. This is in response to a rise in violent crime in the rural areas of Ireland and fewer Gardai (Irish national police) stationed there. According to another story, there are 220,000 gun licenses in Ireland with the vast majority being issued for shotguns used in hunting. As I understand it, Irish law does not allow the average person to obtain a firearm for personal protection purposes though some are trying to change this. Metro describes itself as a free daily newspaper "written and designed for young and ambitious professionals" which is meant to be read during their morning commute. In other words, yuppies and hipsters living in the big city. Their New York City edition ran a story on Monday about Project Appleseed. It was part of a series for what they called "Gun Week" which seems to be mostly regurgitated press releases from Mayor Bloomberg's Illegal Mayors. In a basement classroom of the Westside Rifle and Pistol range, near the Flatiron Building in New York City, students are being given a lesson in early American History. It has a lot to do with guns. There are 14 students in the classroom, seven woman and seven men. The students have paid less than the price of an average New York dinner to spend three hours together, to learn how to shoot a small caliber rifle and take a rose-tinted walk through the history of the founding of the United States. This is Project Appleseed, created by the Revolutionary War Veterans Association, dedicated to spreading the art of rifle marksmanship and its place in American history. A mission the group describes on their website as a bulwark against “American ignorance and apathy.” It speaks volumes to the nature of the Apple Seed volunteers that the group doesn’t descend into some thin-veiled, if well-armed, Tea Party propaganda machine. In an effort to not frighten the hipsters away, they say Project Appleseed is a "middle ground" in the gun debate. Project Appleseed, and events like it, represents the closest thing to a middle ground in the gun debate that there is in the country right now. It’s a place where the debate can be stripped of some of its caustic rhetoric and returned to something approaching rational conversation as novices learn about the pros and cons of gun ownership. The photos that accompany the article are of another Project Appleseed event run by Nick Cirillo. Given his name, I wonder if he is some relation to the legendary Jim Cirillo. Knife Rights and an assortment of individuals are suing Manhattan District Attorney Cyrus Vance, Jr. and the City of New York over its vague definition of what constitutes gravity and switchblade knives. The case, Knife Rights et al v. Cyrus Vance, Jr., et al, is being tried in US District Court for the Southern District of New York. On Wednesday, US District Court Judge Katherine Forrest, a 2011 appointee of President Obama, dismissed the case stating that the plaintiffs lacked standing because they had not identified what was legal or not legal in their complaint. Excuse me, Judge Forrest, but duh! The whole point of the lawsuit was to force New York to define exactly what knives were legal or not legal under their definition. The District Attorney has already agreed that the same make and model of a knife could be found to be both legal or illegal. If that isn't vague, what is? Another aspect of this case is that Vance was shaking down knife retailers for money with an efficiency that would make Mafia dons envious. He collected over $2 million from retailers trying to avoid prosecution. Knife Rights says they plan to appeal this ruling. Their response to the ruling is below. A U.S. District Court Judge has ruled that persons falsely arrested or threatened with arrest have no standing to sue in Knife Rights' Federal civil rights lawsuit against New York City and District Attorney Cyrus Vance Jr. Although every prior ruling in the case went our way under two previous judges, the case was recently reassigned to Obama appointee Katherine B. Forrest. Litigation always presents the risk that a judge (and especially a judge new to a case) will make an erroneous ruling. On Wednesday the judge ruled that the plaintiffs in our case - who have been falsely arrested or threatened with arrest over common pocket knives - do not have standing to sue, in part because the case documents don't identify specific knives that would be illegal under New York City's interpretation of state law. The trouble is, it's nearly impossible to identify them under New York City's haphazard and inconsistent approach - which is the whole point of the case in the first place! Even the DA has admitted that different specimens of the exact same make and model knife could be simultaneously found to be both legal and illegal! Click to read the judge's ruling. So here we have a situation where we're suing because we can't know with certainty what's legal or banned, yet the judge is saying we don't have standing to sue precisely because we haven't identified what's legal or banned in our court papers. That's simply absurd! But even if the judge were correct - which she is not - she was required by well-established legal principles to allow us a chance to amend our papers to "correct" the supposed "defects." Instead, she simply ignored these principles and declared the case over. A similar situation arose in a recent lawsuit involving a U.S. District Judge in neighboring New Jersey. After straining to find supposed "defects" in the complaint that affected standing, the judge refused to allow the complaint to be amended to correct the "defects." On appeal, the ruling was reversed and the appeals court criticized the judge, saying she had abused her discretion. The same thing could happen here. But whatever happens, this ruling forces Knife Rights to spend more time and money to appeal the judge's decision - all while Rome continues to burn. We still receive calls every week from innocent citizens whose lives have been turned upside down simply because they carried a basic tool, a pocket knife, in New York City. Thousands have been arrested on bogus illegal knife charges. In at least one instance of which we are aware, the result of the bogus arrest was that the victim's entire knife collection was confiscated from his home. Gun owners have had their firearms confiscated based on bogus knife arrests. We cannot let New York City succeed in its attempt to redefine "gravity knife" to include ordinary folding knives. This could become a model for other cities and jurisdictions across America, resulting in knife owners throughout the country being arrested for doing nothing wrong. We cannot let that happen! And, we will not! Knife Rights is carefully planning its response to Judge Forrest's ruling. We will never stop fighting for your rights, and neither should you. Please help us win this critical battle by contributing to Knife Rights Foundation's Legal Fund today as generously as you can. We've led the fight to defend knife rights in the legislative arena and we are pioneering it in the courts. Please help us defend freedom! The North Carolina School Board Action Center is a 501(c)(4) organization funded by individual county school boards. As a 501(c)(4) organization, they are allowed to lobby the General Assembly and take part in political campaigns so long as their "primary activity is the promotion of social welfare" according to the IRS. The NCSBAC is the political action arm of the North Carolina School Boards Association and receives its funding through property taxes allocated to the local school boards. It seems that one of their primary legislative objectives is the repeal of that part of NC GS 14-269.2 which allows limited campus carry for employees who live on campus and allows concealed carry holders to store a firearm in their locked vehicles while on school property. Grass Roots North Carolina is taking issue with tax money being used to lobby against our gun rights. They released an alert yesterday about it and ask that people contact their local county commissions and school boards to make their displeasure known. Since Governor Pat McCrory signed HB 937 into law, the North Carolina School Board Association has been touting its newly formed North Carolina School Board’s Action Center (NCSBAC), a new 501(c)(4) organization designed to “strengthen local school board advocacy efforts”. The group receives its funding from individual county school boards through the collection of property taxes. Among their stated primary objectives is to advocate for the repeal of NCGS 14-269.2, which recently granted law-abiding North Carolinian’s with limited campus carry provisions. That’s right, the NCSBAC is devising a scheme to misappropriate tax dollars collected for education purposes to fund their anti-gun agenda! The brainchild of Charlotte-Mecklenburg School Board Vice-Chairman Tim Morgan and political director Leanne Winner, who has been crisscrossing the state spewing her propaganda during district-wide legislative reviews, has made the organization’s intentions clear: to attack the limited Campus Carry provisions which go into effect on October 1st. Specifically, she has advised local school board members that “NCGS 14.269.2 is a safety concern for public schools”. She repeatedly and mockingly states that the reason for allowing concealed carry permit holders to retain their guns in a locked car was to provide them with the opportunity to "save the day" in the event of a school shooting. But, in her opinion, the real effect of the legislation was to create a situation where adults angry over the outcome of a high school football game could settle their disputes by “shooting it out in the parking lots". Winner goes on to say that NCSBA will use their 501(c)(4) organization to repeal this provision of NC GS 14-269.2. While the continued economic downward turn is forcing teacher layoffs and reduced funding to schools across the state, the notion that what little funds remain be spent on pressing a personal political agenda becomes all the more incredulous. Our tax dollars can be utilized in a multitude of more efficient ways to raise and maintain the educational standards of our children than to have them diverted into such pet projects filled with outright anti-gun propaganda. You CAN make a difference! Using the suggested message and contact information below, contact your local School Board and county commissioners today and demand that they no longer fund the NCBAS until such time as they turn their attention away from personal political projects and return to working to better the educational system in North Carolina in a more meaningful way. CONTACT YOUR LOCAL SCHOOL BOARD: Using the contact information provided below and suggested message, contact your local school board members and demand that tax money not be spent to fund the NCSBAC which will be used to attack NC GS 14-269.2 by advocating its repeal. CONTACT YOUR LOCAL COUNTY COMMISSIONERS: Using the contact information below, contact your county commissioners and demand that tax money not be appropriated to fund the NCSBAC which will be used to attack NC GS 14-269.2 by advocating its repeal. School board email addresses can be found by selecting the “Search Organization” option and typing in your county. Contact your county commissioners by selecting your county here . Suggested Subject: "Education Tax Dollars Should Not Be Misappropriated for Anti-Second Amendment Agenda"
It has been brought to my attention that the North Carolina School Board Association has created a 501(c)(4), the North Carolina School Board’s Action Center, with the intent to specifically target positive pro-gun legislation recently signed into law. As a parent/ grandparent/ taxpayer, I am seriously offended that any school board member would condone siphoning money earmarked for education purposes to attack my Second Amendment rights or any other personal political agenda. I hope that you will represent me by advocating for education and demand that no money from our county school board be used to fund the NCSBAC efforts. I will be monitoring this situation via alerts issued by Grass Roots North Carolina and will remember to vote accordingly. It has been brought to my attention that the North Carolina School Board Association has created a 501(c)(4), the North Carolina School Board’s Action Center, to specifically target positive pro-gun legislation recently signed into law. As a taxpayer within your county, I am offended by this scheme and ask you to instruct the school board that none of our tax dollars be used to fund the NCSBAC. I adamantly oppose any misuse of education funds. I hope that you will represent me by advocating for education and demand that no money from our county school board be misappropriated by the NCSBAC. I will be monitoring this situation via alerts issued by Grass Roots North Carolina and will remember to vote accordingly. Grass Roots North Carolina has two big upcoming events - one a "meet and greet" this weekend and the other is "dinner and a movie" in various NC cities on October 1st. The latter is on the day that the new gun laws go into effect which include the ability to carry concealed in restaurants that serve alcohol. To clarify, a person who is legally carrying concealed in North Carolina is forbidden by law to consume alcoholic beverages while carrying. Bunnlevel is in Harnett County about halfway between Raleigh and Fayetteville. If I lived closer, I'd love to attend. Range 37 PSR Gun Club is one of the premier gun clubs in North Carolina and looks like a fantastic facility. 1st Annual GRNC Meet, Greet, Eat & Shoot at 37 PSR in Bunnlevel, NC on Saturday, September 28th from noon until 6pm: The event is $30 per person (free under 16) and will be a great opportunity to come out and spend the day with many of the GRNC volunteers who work hard for our gun rights every day. Dinner is potluck, so bring a dish and utensils. For info: GRNC@nc.rr.com or call 877-282-0939. GRNC Dinner and a Movie: Celebrate restaurant carry when it takes effect on October 1 by joining GRNC in Asheville, Hickory, Charlotte (Matthews), Greensboro, Durham or Fayetteville. Where? Texas Roadhouse restaurants, which have already promised they will not post against concealed carry. For info: DinnerandMovie@GRNC.org or call 877-282-0939. SIGN THE “STOP THE GUN BAN” PETITION: Go to: www.StopTheGunBan.org Whether or not you have already signed it, forward this to others and tell them to sign it too. The Citizens Committee for the Right to Keep and Bear Arms, like the NRA, was dismissive of the signing of the UN's Arms Trade Treaty by Secretary of State John Kerry in New York today. BELLEVUE, WA – Secretary of State John Kerry may have signed the controversial United Nations Arms Trade Treaty today, but tomorrow it begins gathering dust in the U.S. Senate, the Citizens Committee for the Right to Keep and Bear Arms predicted. For the ATT to be ratified requires two-thirds confirmation by the Senate. But Gottlieb noted, as did Sen. Inhofe in his letter to Secretary Kerry, that 53 senators have already indicated they will reject any treaty that threatens the Second Amendment. “If this was all theatrics by the Obama administration,” Gottlieb observed, “the president and Secretary Kerry need better script writers. And we will remind the administration of the warning it received Wednesday morning from Sen. Bob Corker, ranking Republican on the Senate Foreign Relations Committee. The Senate has not given its advice or consent on this treaty, so ‘the Executive branch is not authorized to take any steps to implement the treaty.’ How does that look to the world when an administration can’t get one of its pet projects approved on Capitol Hill? The National Rifle Association has been a staunch opponent of the UN's Arms Trade Treaty from the beginning. They issued the response below to the signing of the treaty on behalf of the United States by Secretary of State John F. Kerry. As Bitter noted in a post on the signing, elections have consequences. Prior administrations not only opposed the talks which led to the Arms Trade Treaty, they actively refused to participate in them. That was then and this is now - unfortunately. Fairfax, Va. – Today, Secretary of State John Kerry signed the United Nations Arms Trade Treaty on behalf of the Obama administration. The National Rifle Association strongly opposes this treaty, which is a clear violation of the Second Amendment to the U.S. Constitution. A bipartisan majority of the U.S. Senate is already on record in opposition to ratification of the ATT. On March 23, the Senate adopted an amendment to its FY 2014 Budget Resolution, offered by Sen. James Inhofe (R-OK), that establishes a deficit-neutral fund for “the purpose of preventing the United States from entering into the United Nations Arms Trade Treaty.” This amendment is in addition to the previous efforts of Sen. Jerry Moran (R-KS) and Rep. Mike Kelly (R-PA) to pass concurrent resolutions opposing the treaty in their respective chambers. Notably, the ATT includes "small arms and light weapons" within its scope, which covers firearms owned by law-abiding citizens. Further, the treaty urges recordkeeping of end users, directing importing countries to provide information to an exporting country regarding arms transfers, including “end use or end user documentation” for a “minimum of ten years.” Each country is to “take measures, pursuant to its national laws, to regulate brokering taking place under its jurisdiction for conventional arms.” Data kept on the end users of imported firearms is a de-facto registry of law-abiding firearms owners, which is a violation of federal law. Even worse, the ATT could be construed to require such a registry to be made available to foreign governments. “These are blatant attacks on the constitutional rights and liberties of every law-abiding American. 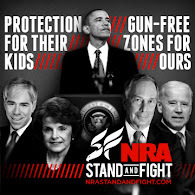 The NRA will continue to fight this assault on our fundamental freedom,” concluded Cox. Secretary of State John Kerry, the vaguely French looking former Senator from Massachusetts who, by the way, served in Vietnam, will sign the UN's Arms Trade Treaty this morning in New York. The State Department release on Kerry's schedule notes that it will be at 9:45am this morning. The signing will be mostly symbolic as the treaty will require 67 senators to vote for ratification. There are currently 53 senators on record, both Democrats and Republicans, as saying they are opposed to the treaty. Senator Jim Inhofe (R-OK) said in a letter to Kerry that this treaty "will collect dust alongside the Law of the Sea Treaty, the Convention on the Rights of Persons with Disabilities, and the Kyoto Treaty, to name a few, which have all been rejected by the U.S. Senate and the American people." I think Inhofe is correct. However, by signing the Arms Trade Treaty, Kerry now makes it possible for the Senate in the future to consider its ratification. Without the United States signing the treaty, it would never come up for consideration. The full text of the Arms Trade Treaty in various UN approved languages can be found here. Hey, JayG! Did You See This? For those that haven't heard, well-known gun blogger JayG of MArooned is leaving the Volksrepublik of Massachusetts for the Commonwealth of Virginia to take a job there. Jay is leaving one commonwealth where gun rights have long been under attack for one that is currently in the good column. However, if gubernatorial candidate Terry McAuliffe (D) has his way, Virginia will become the next Colorado. And by this, I mean the pre-recall Colorado with magazine bans and universal background checks. McAuliffe wants to one-up Hickenlooper by also implementing a one-gun-a-month purchase restriction. Like Hickenlooper, he appears to be in Bloomberg's pocket. Support common sense gun control measures As Governor, Terry will support mainstream and majority supported gun control measures like universal background checks, limiting the size of magazines, and a return to the 1-gun-per-month rule. These measures respect Virginians’ right to bear arms while reducing gun violence. According to a poll published on Monday in the Washington Post, McAuliffe is leading Attorney General Ken Cuccinelli (R) by 47 to 39 percent among likely voters. Cuccinelli has been a good supporter of gun rights and this has been recognized by the gun prohibitionists. JayG better hurry up down to the Old Dominion as I think his vote may well be needed. As to McAuliffe, I think the Virginia's state motto applies - sic semper tyrannis. Today's Wall Street Journal has a report on the background screening of the Navy Yard shooter. You may remember there have been many reports about his secret security clearance as well as his passing a NICS background check when he purchased his Remington 870 shotgun. There are also quite a number of reports of his run-in's with law enforcement in both Washington State and Texas involving firearms as well as reports on his signs of mental illness. Given all of this, how did he pass his security background checks to join the Navy as well as obtain a secret security clearance as a contractor? That is a question for which military officials are seeking answers. To put it quite simply, he lied. Last week, the Office of Personnel Management, the agency in charge of overseeing most federal background security checks, said USIS had conducted a complete investigation of Mr. Alexis, including information on the 2004 arrest. On Monday, the agency said Mr. Alexis had turned in an incomplete security background form in 2007 that omitted information about the arrest as well as financial problems in his past. After uncovering the problems in the normal course of the examination, investigators asked the Seattle Police Department for information on Mr. Alexis. But the department refused, according to the OPM. The Seattle Police Department didn't immediately respond to requests for comment. In the 2004 report, Mr. Alexis told Seattle police at the time he shot out a construction worker's car tires in an "anger fueled" blackout because he believed the man had been mocking him. But Mr. Alexis told a USIS investigator he had gotten into a parking dispute with construction workers near his Seattle home that escalated to a construction worker putting something into the gas tank of Mr. Alexis's car. Mr. Alexis said he retaliated by "deflating" the man's tires, but never mentioned that he did so by firing three shots into the car, according to a copy of the USIS investigation released by the Navy. This, of course, doesn't let the Navy off the hook for letting the shooter resign from the Navy with an honorable discharge with "a favorable rating". His conduct had caused the Navy to reprimand him several times and they had tried to push him out. I can see letting him resign with an honorable discharge just to get rid of a problem. It is the bureaucratic way to deal with problems and there is less paperwork. However, granting him a "favorable rating" made him eligible to re-enlist in the military and probably facilitated his security clearance. As can be seen on the Navy's NavPers Form 1070/615, an honorable discharge from the Naval Reserve could have been granted without making the seaman eligible for reenlistment. The bottom line is that the clearance system failed in this case. More importantly, the mental health system in this country has changed in the last 30 or so years that probably the one thing that may have prevented the shootings in the first place - early intervention and involuntary commitment - is almost a thing of the past. Despite the speculation by TTAG that Illinois is now a constitutional carry state with the Illinois Supreme Court's decision in Aguilar v People, Thirdpower at Days of our Trailers has a warning about not to tempting fate. Even though TTAG is claiming that IL is a 'Constitutional Carry' State, you can still get your @ss arrested. Given that Thirdpower is a lifelong Illinoisian and is active in Illinois gun politics, I'm going with him on this one. You might beat the charge of unlawful use of a firearm but you'll probably never see your gun again. It's time to help out friends in California. While many might write California off as a lost cause, it isn't so long as you have groups like CalGuns, Cal-FFL, and the Firearms Policy Coalition fighting them. Gov. Jerry Brown (D-CA) might also be known as Gov. Moonbeam but he is a gun owner and signed on to the amicus brief in support of the McDonald case when he was the Attorney General. So help out our friends in California and perhaps win a Benelli M4 while you are at it. Oppose DOJ's new anti-gun regulations NOW! WHEN: BEFORE 5 p.m. on Tuesday, September 24, 2013. WHY: Among other things, DOJ is trying to make "DROS delays" permanent and remove its lawsuit liability through their proposed regulations. HOW: Use FPC's fast, easy, and free TAKE ACTION contact form at https://www.firearmspolicy.org/the-issues/california/2013-2014/proposed-doj-regulation-11-ccr-4210-et-seq. A letter to DOJ addressing these outrageous proposed regulations is already built-in to the FPC TAKE ACTION contact form; however, you may edit the text as you like to reflect your personal concerns. PUBLIC HEARING: DOJ will hold a public hearing to receive public comments on the proposed regulatory action at 1:00 p.m. on September 24, 2013, at the Department of Water Resources Auditorium located at 1416 9th Street, in Sacramento, California. The auditorium is wheelchair accessible. At the hearing, any person may present oral or written comments regarding the proposed regulatory action. DOJ requests, but does not require, that persons making oral comments at the hearing also submit a written copy of their testimony. Please send your letter RIGHT NOW, then SHARE THIS IMPORTANT MESSAGE to all of your pro-gun family and friends. Post on Facebook & Twitter -- help us get the word out! NRA News has added a new face to their stable of commentators. Joining Colion Noir, Dom Raso, and Natalie Foster is Billy Johnson. His goal is to get people to start looking at things and events in a different way. He has a YouTube channel called AmidsTheNoise. In his first video for NRA News, Billy argues that policymakers have a mistaken focus on the tools of violence rather than the logic of violence. An example of this would be gang leaders. They got to be gang leaders by using violence to show that they were the meanest and baddest. Whether they used a Glock, a switchblade, or their fists to kill or maim their rivals is not the issue. The issue is that they were willing to use violence to achieve their aims. Likewise rewarding social outcasts with instant celebrity or infamy after incidents like Aurora or Tucson has the effect of rewarding violence - even in mainstream society. I look forward to more of Billy's commentaries. I have embedded his first one below. What Do McDonalds And Dunkin Donuts Have To Say About Carry In Their Stores? Howard Schultz's letter requesting that customers refrain from carrying their lawfully owned firearms in Starbucks hit a nerve last week. It not only unleashed a tsunami of criticism from gun owners but it caused a number of introspective posts from gun bloggers regarding open carry. The tactics of some open carry activists were especially subject to criticism. All of this controversy led to questions about Starbucks's competitors and their policies. Business Insider, a business website, reached out to both McDonalds and Dunkin Donuts to find out their policies. In essence, they will abide by the local and state laws where their stores are located. “We recognize that there is a lot of emotion and passion surrounding the issue of firearms and open carry weapons laws. While we respect the differing views of all our customers, McDonald’s company-owned restaurants follow local, state and federal laws as it relates to open carry weapons in our restaurants. "Dunkin’ Donuts and Baskin-Robbins restaurants are owned and operated by individual franchisees who are required to follow all federal, state and local laws with regard to firearms." While North Carolina has had open carry since 1921, I would hope that open carry activists would use some discretion. It is one thing to have a revolver or pistol on your hip; it is entirely another thing to carry an AR or shotgun on a sling. Let's face it, when the average gun owner open carries, it is a handgun unless they are out in the woods. In the latest training tips video from the National Shooting Sports Foundation, NSSF's Dave Miles discusses long range shooting with Rod Ryan of Storm Mountain Training. In particular, they discuss trace or the wake of a bullet as it pushes through the air. If you watch the video below carefully, you can see the actual trace or path of the bullet. Having a spotter watch the trace will allow you to make the necessary corrections for long range shooting. In the latest NRA video from Il Ling New of Gunsite, she talks about the importance of creating and maintaining distance. While this series of short videos is aimed at women and is sponsored by NRAWomen.tv, her advice applies for both men and women. Distance from a potential threat is good, more distance is better. I haven't bought my NC Sportsmans License yet this year. Even if I don't get out hunting I do try to buy one to help support the NC Wildlife Resources Commission. In North Carolina, the Sportsmans License cover you for everything from fishing to big game hunting. The only thing it doesn't cover is the Federal Duck Stamp and fishing in coastal waters. The National Shooting Sports Foundation just published a new infographic that presents the economic impact of hunters and hunting. The estimated impact of hunting in America is greater than the revenue generated by Google - $38.3 billion versus $37.9 billion. The CalGuns Foundation has filed a Federal lawsuit against California Attorney General Kamala Harris for her policy of forbidding firearms purchasers to take possession of their lawfully-purchased firearms due to delays in the DROS background check. Current California law requires that a firearms purchaser receive their firearm at the end of a 10-day period unless they determine the purchaser is ineligible to purchase or possess a firearm. One of the plaintiffs in this lawsuit has been waiting 18 months! CalGuns filed a similar lawsuit in state court back in April of this year. 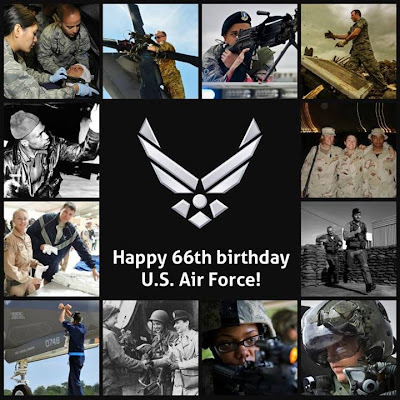 Today is the official birthday of the United States Air Force. It marks the day in 1947 that the Army Air Force was made its own branch of the armed services. It is also, fittingly enough, the birthday of the Complementary Spouse whose father, brother, and sister-in-law have all served as US Air Force officers. 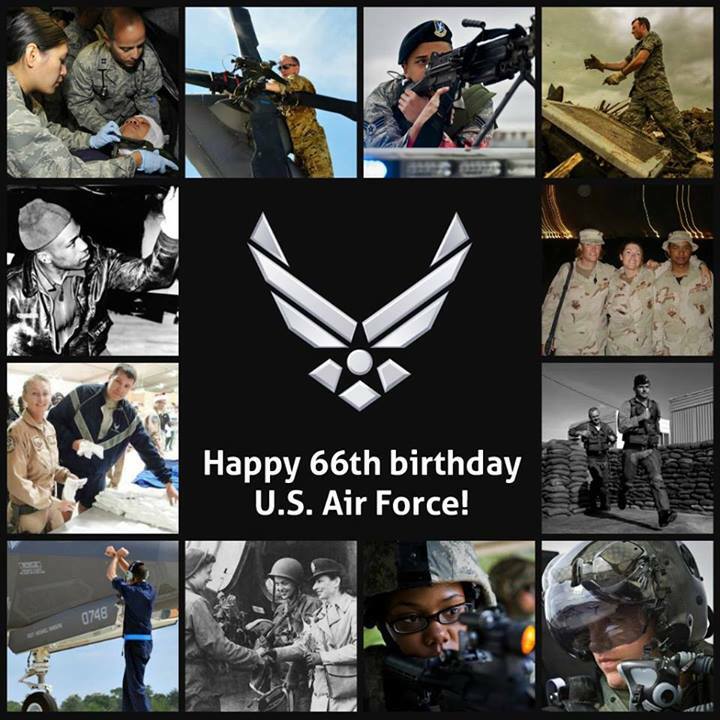 So happy 66th birthday to the USAF! I'm neither a proponent nor opponent of open carry. I don't tend to do it because I want to keep the bad guys guessing. That said, if you want to open carry that is your option. If you do, I promise I won't be like Robert Gursky of Glastonbury, Connecticut. According to this story in the Hartford Courant, Mr. Gursky was so freaked out by a gentleman legally open carrying at his local bank that he slid the teller a note that said "gun". The teller did what he or she was trained to do - they hit the silent bank robbery alarm. Mr. Gursky was arrested for breach of peace and has to appear in court next week. And the man open carrying? He was interviewed by the cops who determined that he possessed his firearm legally and that was that. There is something to be said for poetic justice. Howard Schultz, CEO of Starbucks, released an open letter yesterday requesting that Starbucks' customers no longer carry when they visit Starbucks. It is a waffling statement meant to appease the gun prohibitionists while at the same time trying not to offend the gun culture too much. As Neville Chamberlain would ruefully attest, appeasement is never a good policy. Mr. Schultz should realize that appeasement is never a good policy when dealing with those who would seek to curtail civil rights. I, for one, will "respect" Mr. Schultz's request - I won't carry, concealed or openly, in his stores. I will even go one step further and no longer patronize his stores or his products. By the way, open carry has been legal in North Carolina without a permit since 1921. That is when the North Carolina Supreme Court ruled it was legal in State v. Kerner saying that the right to keep and bear arms under the North Carolina Constitution was "a sacred right". Fakhoury said it was the first case in Cook County to be dropped after last week's ruling and that there could be more challenges filed. "Basically the federal courts said one thing and the state court said another," Fakhoury said. "But the state court is now following the federal ruling." Mr. Haddad, an IT professional and married father of three, obtained his FOID card and then a .45 caliber handgun after he was attacked while stopped at stop sign. Mr. Haddad also started carrying his pistol despite the general prohibition against carry by Illinois state law. This is what led to his arrest for unlawful use of a weapon. His defense attorney, Matt Fakhoury, discusses the case in the video at this link. "do ordain and establish this Constitution for the United States of America. " On this date, 226 years ago, the members of the Constitutional Convention signed the final draft of the US Constitution. The president of the Convention, George Washington, sent the following letter along with the Constitution to the Confederation Congress for transmittal to the 13 states for their ratification. The facts are just starting to trickle in on the shooting at the Washington Navy Yard. A number of people have been wounded or killed and the police say three men in "green and khaki military style clothing" are the suspected shooters. One of the shooters is dead and the authorities are searching for the other two. The bottom line is that we don't know enough about what is going on to make a reasonable judgment. It could be a terrorist attack or it could be disgruntled former employees. However, this lack of solid information does not stop Washington Post columnist Petula Dvorak from condemning US gun laws and the gun culture. This in a city where the gun laws are so strict that Emily Miller got a number of columns and a whole book out of her journey to gun ownership. Virginia Tech, Fort Hood, Tucson, Aurora, Newtown. And now Washington. At least 12 people were killed in a burst of gunfire at the Navy Yard on Monday morning, including one of the suspected shooters. And the toll could climb higher. Another rampage. This one, for me, very close to home. My kids and I biked to the Navy Yard on Saturday. How can this country tolerate another mass shooting, after we’ve endured so many others? And why have we allowed ourselves to grow accustomed to this awful bloodshed? Because that’s what these slaughters have become: practically routine. “How many this time?” we ask as we watch the number of dead and injured climb on TV or Twitter. We don't have all the details, the cops don't have all the details, and Ms. Dvorak certainly doesn't have all the details. But what are details and facts when you have an agenda to push? Sen. Richard Durbin (D-IL) is the chairman of the Senate Judiciary Committee's Subcommittee on the Constitution, Civil Rights, and Human Rights. As mentioned before, he plans to hold a hearing on so-called Stand Your Ground laws. He has entitled his hearings, "‘Stand Your Ground’ Laws: Civil Rights and Public Safety Implications of the Expanded Use of Deadly Force". This hearing is scheduled for tomorrow at 10am. The witness list for the hearing has been published. Sybrina Fulton really needs no introduction as she got more than her 15 minutes of fame during the George Zimmerman trial. Lucia McBath was the mother of Jordan Davis who was killed in a confrontation in Jacksonville, FL by Martin Dunn. Mr. Dunn is charged with 1st Degree Murder in the case. Ms. McBath is concerned that Dunn will try to claim self-defense under Florida's "stand your ground" law. Willie Meggs is the State Attorney (or DA) for the 2nd Judicial Circuit which includes the Tallahassee area of Florida. He is a well-known opponent of the Florida "Stand Your Ground" law and has called it "the dumbest law ever put on the books." Ronald Sullivan is a Professor of Law at Harvard Law School. About the only thing I could find about regarding either Trayvon Martin or "Stand Your Ground" laws is that he spoke to a pro-Martin demonstration held by the Black Law Students Association at Harvard. He will also be a speaker on a panel discussing "Guns, Violence, and Children" at the American Association of Law Schools conference in January 2014. John Lott, of course, needs little introduction as he is one of the leading pro-gun researchers. Ilya Shapiro is a Fellow at the libertarian Cato Institute. The Cato Institute has made Durbin's enemies list. In an article posted in August, Shapiro practically demanded Durbin include him in the list of speakers at this hearing. What will make this joke of a hearing even more interesting is that the Ranking Member for the Republican side is Sen. Ted Cruz (R-TX). While Durbin will rail on about the Koch Brothers, ALEC, and conservatives, I expect Cruz will be up to the challenge. The time for the 2013 Gun Rights Policy Conference is fast approaching. It is scheduled for September 27th through 29th in Houston, Texas at the Marriott Hotel near the George Bush Intercontinental Airport. I had hoped to go to this year's GRPC as I have attended the past three. However, personal finances being personal finances, I had to decide between going to GRPC or going to a conference in October that should help me business-wise. If you are in the Houston area or within driving distance, I can recommend it. The speakers are excellent but it is really the people from around the country who are active in the gun rights movement that make the conference. I've made lifelong friends from the people that I've met at the past conferences. If you can't swing a full weekend, go on Saturday as that is the main day. BELLEVUE, WA – U.S. Representative Steve Stockman (R-TX) will be among the speakers later this month at the 2013 Gun Rights Policy Conference at the Marriott Hotel Houston, Tex. Airport hotel, an event that will also feature several national gun rights leaders. Congressman Stockman will speak during the annual luncheon on Sept. 28. Also on the schedule are Emily Miller, senior opinion editor at the Washington Times and author of the just released Emily Gets Her Gun…But Obama Wants to Take Yours; attorney Alan Gura, winner of both the Heller and McDonald Second Amendment cases before the U.S. Supreme Court; John Fund, national affairs columnist at National Review Online and senior editor at The American Spectator, and John Lott, author of the landmark More Guns = Less Crime and a Fox News.com contributor. The conference is jointly sponsored by the Second Amendment Foundation and Citizens Committee for the Right to Keep and Bear Arms. This is the 28th annual GRPC. The 2013 GRPC will feature more than 60 speakers on subjects ranging from politics to personal protection. The weekend event typically attracts more than 500 gun owners, activists and experts from across the country. Attendance is free, and on-line registration is available at www.saf.org. WHERE: Marriott Hotel Houston, Tex. Airport, 18700 John F. Kennedy Blvd., Houston, Tex. And remember, the conference is free. All you have to pay is your travel and lodging. If you live in Iowa or will be in the Des Moines area on Tuesday, Second Amendment scholar David Young will be giving a Constitution Day speech on the Second Amendment at Des Moines Area Community College, Ankeny Campus. It is my understanding that there will be two speakers on this date. The first, Prof. Steffen Schmidt, a political science professor at Iowa State University, will speak at 10:30 AM in the auditorium in Building 6. My one hour presentation will be outside the southeast facing main entrance of Building 5 on the DMACC Ankeny Campus at 11:30 AM, September 17, 2013. The presentation will emphasize Second Amendment historical development and why its purpose naturally has such an extensive impact on the current gun control controversy. I have rarely given public presentations on this subject. My plan at Ankeny is to provide considerable time for questions and answers. For anyone interested in an eye-opening presentation on the Second Amendment's purpose based on my most recent research into Founding Era sources, don't miss this. Please let your friends and other interested parties know about the event. More info and a link to a map can be found here. I have both of David's books and had a chance to chat with him at the Gun Rights Policy Conference held in Chicago in 2011. He is a nice guy who knows his topic. If I lived in Iowa, I'd be at that presentation. Il Ling New of Gunsite is doing a series of Tips and Tactics videos for the NRA Women campaign. Her latest is a good reminder for all of us, man or woman, on situational awareness. I especially like her reminder about how one should pay attention if you get that feeling things are not just right. Too often we ignore that at our peril. In the piece below from Ginny Simone of NRA News, you can hear the grassroots activists like Victor Head of Pueblo Freedom and Rights explain what they did on Tuesday. They organized, they worked, and they overcame a tidal wave of outside money to recall two state senators who not only ignored the wishes of their constituents but didn't even want to hear them. If you want to hear more from the organizers of the recall, listen to Shooter Ready Radio this afternoon/evening. I know a number of the organizers will be guests on the program. You can listen live on the radio as well as the internet. Details are here. Second Amendment attorney Dave Kopel has a very interesting analysis on the results of the Colorado recall elections at the Volokh Conspiracy. He, like I, thought Giron might survive and Morse ousted given the nature of their districts. So why did Angela Giron lose in her heavily Democratic, blue collar, union stronghold of a district? According to Dave, it is because she crossed the double-red line of Colorado politics. It wasn't just that she voted against gun rights but that she, as chairperson of the Senate State Affairs Committee, shut out the testimony of many of those who wanted to testify. Colorado has a tradition of letting everyone who wants to speak on a bill the chance to testify, if only for a few moments. The Second Amendment right to keep and bear arms was the secondmost important reason why Morse and Giron were removed from office. The first reason was the Fifth and Fourteenth Amendment principle of Due Process of Law. The opportunity to be heard is the fundamental to Due Process of Law, and not solely in adjudications. When Morse and Giron squelched the testimony of law-abiding citizens and of law-enforcing Sheriffs, they grossly abused their constitutional office of being law-makers. And so, for abuse of office, John Morse and Angela Giron have been recalled from office by the People of Colorado, to be replaced by legislators who will listen before the vote. Read the whole analysis here. It is well worth reading and worth sending to your representatives as a warning of what happens when they won't even take the time to listen. "Thousands Of Grass-Fed, Organic Bombs"